Love is a major theme in Persian poetry and can be interpreted in various ways - as mystic love, the basis of the relationship between human and God or as passionate or affectionate love between lovers, husbands and wives, parents and children, family and friends, or even as patriotic love for Iran. Poetry is part of the everyday life of almost every Iranian - we are continuously exposed to names such as Rudaki, Firdausi, Umar Khayyam, Sa'di, Hafiz, Maulavi Rumi, Nizami and many others. 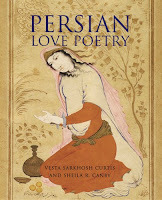 Poetry is much enjoyed by Iranians and other Persian (Farsi) speakers, who find solace and pleasure not just in the poetic language but also in the poet's philosophical and human approach to life - above all, in a mystic (sufi) view of the world, reaching truth and God through intense love and devotion. Ghazal: a short poem, 7-15 lines, all having the same rhyme. The last line normally include the signature of the poet. Generally resembling the sonnet and used for lyric poetry, it emboides the essence of Persian poetry. Masnavi: based a rhyming couplets and used mainly for longer poems of a narrative or didactic form. Qasida: a long monochrome, the most favoured form for court poetry, and often used for praising the poet's patron or benefactor. Qit'a: monorhyme, usually 3-20 lines, used for casual subjects, satire, ethical or moralizing themes. Ruba'i: quatrain, best known through Umar Khayyam's amorous and philosophical poems. Dua bayit: a version of the ruba'i, mostly occurring in popular poetry. Joy mixed with your sorrow increases my unhappiness. Here is separation and there is connection. I drank the wine of union until the morning. I wait - when will there be another night like that? Or falls in love with the one who gives life. May not even be found in the realm of God.